Amitav Ghosh is not a professional academic critic, yet at times he is simply impelled to write about writers that overwhelm him. The essay on Agha Shahid Ali's poetry, "The Ghat of the Only World," is lyrical and analytical at the same time; it is obituary and critique at one go. Another highlight of Amitav's critical methodology is the simultaneous presence of various timeframes and cultural contexts that he employs to understand the implications of a work of art in the larger civic context. Ghosh has the flexibility to invoke Cervantes to understand Babar's Babur-nama. He has the range to discuss writers as different as Michael Ondaatje, Agha Shahid Ali, Shyam Sevadorai in the larger context of civil strife and ethnic violence all across the subcontinent. Spice-encounter at the beginning of the colonial period becomes a cultural correlative of Oil-Encounter in 70s. But despite all his anthropological, academic and activist predilections, it is ultimately Amitav Ghosh, the writer of fine literary sensibili who excels. A rural landscape is described thus: "a maze of low mud huts huddled together like confectionery on a tray." The singing of the bride is likened to the "the bloom of pomegranate." "An Egyptian in Baghdad" is more a tragic short story of Egyptian migrants to Iraq who send money towards the building of their pucka houses back home but never come back to occupy them. "The Slave of MS.H6" has the trappings of an anthropological detective fiction. The essays which deal with the ethnography of the UN peacekeeping force in Combodia, the non-institutional character of Indian diaspora, the fundamentalist challenge in the Post-Cold War period are equally remarkable for their analytical rigour and poetical vigour. The self-critical, perceptive title essay relates an incident from his time doing fieldwork in Egypt. He argues with an intolerant village imam over the relative merits of cremating the dead, as Indian Hindus do, and the Egyptian Muslim practice of burying them. The imam calls the Hindu custom "primitive" and argues that the "advanced" West doesn't burn dead bodies. Ghosh, soon incensed, lashes out, saying that even Western countries burn their dead: "They have special electric furnaces meant just for that." Both sides are stung. The imam accuses Ghosh of lying, with the logic that the West cannot be so ignorant, as they "have guns, tanks and bombs". Ghosh retorts that India not only has those heavy armaments but also nuclear weapons: a response that shocks Ghosh himself. "So there we were," Ghosh concludes, "the imam and I, delegates from two superseded civilizations vying to lay claim to the violence of the West." This subtle, all encompassing worldview is vintage Ghosh. His historian's eye takes in the breadth of peoples' experiences, and his anthropologist's mind makes connections between their religions, wars, cultures and ways of life. Above all, he describes these complex connections with simple profundity - with the skill of the novelist that he is. Ghosh can be jocular, too, without being trite. His essay "Four Corners" about a road trip in the US illustrates his keen observational powers and ability to relate the commonplace to history. America's recreational vehicles (RVs), are, in his words, "if not quite palaces, then certainly midtown condos on wheels". He notices their curious names, Native American words like Winnebago and Itasca. "The names of the dispossessed tribes of the Americas hold a peculiar allure for marketing executives of automobile companies. Pontiac, Cherokee - so many tribes are commemorated in modes of transport," Ghosh observes. And then, as always, the summing up: "It is not a mere matter of fashion that so many of the cars that flash past on the highways carry those names, breathing them into the air like the inscriptions on prayer wheels. This tradition of naming has a long provenance: Did not Kit Carson himself, the scourge of the Navajo, name his favorite horse Apache?" Why doesn't Ghosh come off as a know-it-all? With disarming frankness, he acknowledges that he doesn't have all the answers, or even explanations, for the fascinating quirks of culture he describes. In a short essay about a New York fundraising party for Tibet, for instance, Ghosh confesses that as an undergraduate, he and his friends would get drunk when they went to eat Tibetan food at a Tibetan refugee camp in Delhi. "You couldn?t help doing so - it was hard to be in the presence of so terrible a displacement." As Ghosh muses thus in the trendy Manhattan restaurant, he catches the eye of the sole monk at the gathering and finds that "... his smile seemed a little guilty: the hospitality of a poor nation must have seemed dispensable compared to the charity of a rich one." Or perhaps he was merely bewildered, Ghosh continues. "It cannot be easy to celebrate the commodification of one's own suffering." Despite the mysterious omission of Ghosh's marvelous essays on Cambodia The Imam and the Indian is one collection that should be on the bookshelves of all who call themselves readers. The 18 essays in The Imam and the Indian were written over a 16-year time span - from 1986 to 2002. Which partly explains the eclecticism of this collection. A translation of Tagore's "Kshudhita Pashan", two essays on the social anthropology of an Egyptian village, an elegy to the Kashmiri poet, Agha Shahid Ali, a travel piece on the Four Corners, some incidental pieces like "A Tibetan Dinner" and "The Ghosts of Mrs Gandhi" - the diversity of genres, subjects, dictions would seem much too heterogenous for compilation in a single volume. 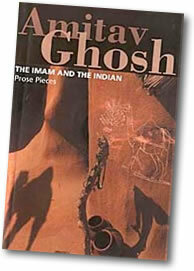 But for Amitav Ghosh, "connections are of greater importance than disjunctions" in the imaginative sphere.One of these "connections", very obviously, is the fact that the pieces were written in the gaps between the novels and hence trace the evolution of the author's interest and ideas that later were transmuted into fiction. Those familiar with Ghosh's fictional career will run into many familiar themes, motifs and characters here. But more notable is Ghosh's fixation with "encounters" between cultures and the modes of thought they embody. It could result, at times, in scepticism - the Imam's suspicion of the doctor al-Hindi, who comes from the land where cows are worshipped and the dead are burnt. Or, it could give rise to conflict like the one between the Navajos and the early settlers in North America. In most cases, the humans caught up in the clash of cultures are unaware of its historical import. Look at Babur's near dislike for the kingdom that he won in the battle of Panipat and which was to earn him a place in history. In the modern world, however, such encounters are almost always violent and throw up a detritus in the form of an uprooted populace. Like the Tibetan monk Ghosh encounters at a New York charity dinner for the Tibetan cause. Some, like Nabeel, are lost to friends and relations forever. Others, like the Sylheti UN peace-keeper entrusted with clearing the Khmer Rouge's mines in Cambodia, learn to cope as best as they can and soon become inured to the brutality around them. And most touchingly, Agha Shahid Ali, a resident of "the country without a pos-office" - Kashmir - who must die of cancer in Northampton, denied the right to go back to his homeland in his last days. What comes in the way of peaceful coexistence between two peoples? And what happens to the people caught in the midst of war or civil violence? Are their any alternative patterns of relations between different cultures - one that does not lead to strife? In the present global scenario, the artist cannot but state which side of the political fence he is on. Thus art itself is a political stratagem. As Ghosh writes in The Shadow Lines, "Every word I write...is the product of a struggle with silence." And memories of violence, experienced or heard of, a weapon of defiance that helps to destroy the "thickening crust of awareness that is both a sign and a reminder of our unwitting complicity in the evolution of violence". Which is why all fundamentalist regimes consider the destruction of literature and art - a way of ordering memory and human values - an article of faith. As every Kashmiri would say with Shahid: "Your history gets in the way of my memory/ I am everything you lost. Your perfect enemy."